The East endures. 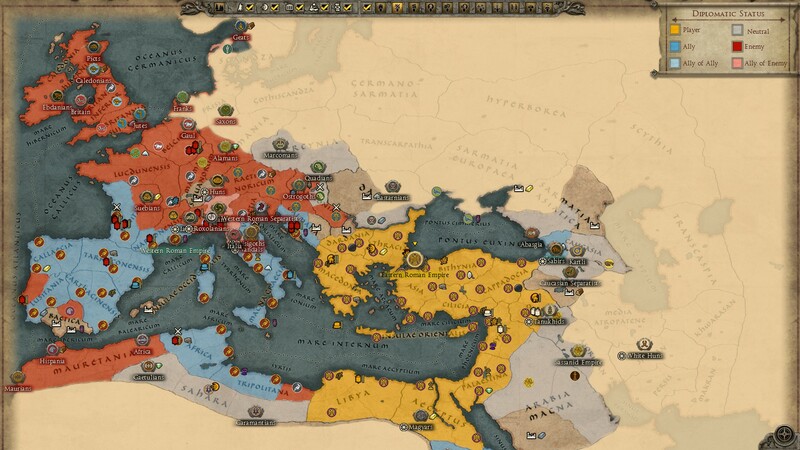 I closed out 2015 by returning to the grand campaign of Total War: Attila, this time as the Eastern Roman Empire. Like its Western sibling, the ERE is beset with enemies. Unlike my WRE game, I’ve been able to fight them off, a journey both exciting and memorable. 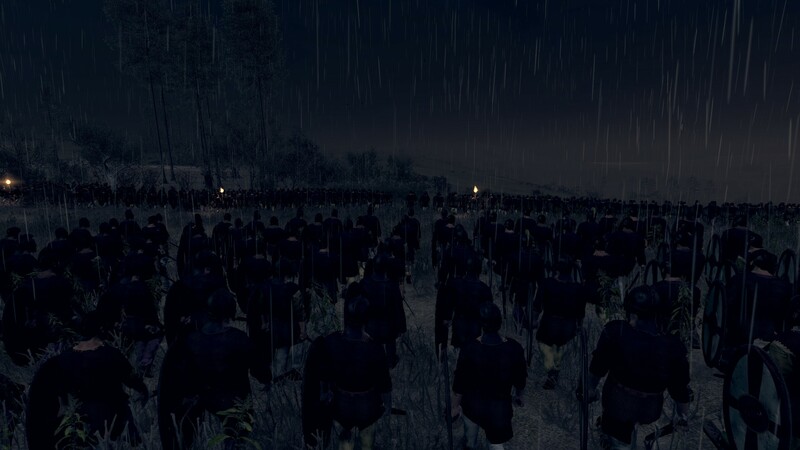 When the Visigoths rampaged through Thrace, and wiped out (at great cost) the first army I sent against them, I hunkered down, raised a new army under the Emperor’s personal command, and caught their weakened force in a night battle, depicted in the screenshot above. The survivors paid an indemnity for peace. When a column of Huns razed a town along the Danube, I mustered an army four times their size, tracked them north, and brought them to ground. Since then, I’ve fought off an invasion of North Africa. I’ve maintained an uneasy peace with Sassanid Persia, plying them with gifts while keeping a legion close to hand. I’ve built farms, aqueducts, and barracks; encouraged religious tolerance; and kept the Empire mostly in one piece. Ahead, I see danger — and opportunity. With the Goths on the march again, and my WRE allies collapsing, I’m preparing a new campaign in the west. Against that, I’ve unlocked higher-tier units, my economy has stabilised, and to the east, the Sassanids are distracted by enemies of their own. If the situation can hold a little longer, I should be well-placed for the midgame. And all this has taken just 28 turns. Easier than my Western Roman Empire run. I suspect this is a combination of: (1) an easier position with fewer enemies, (2) balance changes since launch, and (3) my greater experience with the game. As such, on Hard campaign/Normal battle difficulty, the challenge is manageable: I’ve been able to beat enemy armies, force their leaders to the negotiating table, and buy myself breathing space, whereas I remember the WRE campaign as a non-stop gauntlet of invading armies. Emboldened, I brought several more regiments to the front. The Huns charged. And when they were committed, I countercharged, using fresh troops I’d hidden in a forest. Roma invicta! Should war break out with the Sassanids, they may require yet another set of tactics. This is an improvement over my WRE game, where I mostly fought Germanic infantry, not helped by the Celts’ lack of distinct units at launch. By the way, my own roster also feels more exotic. 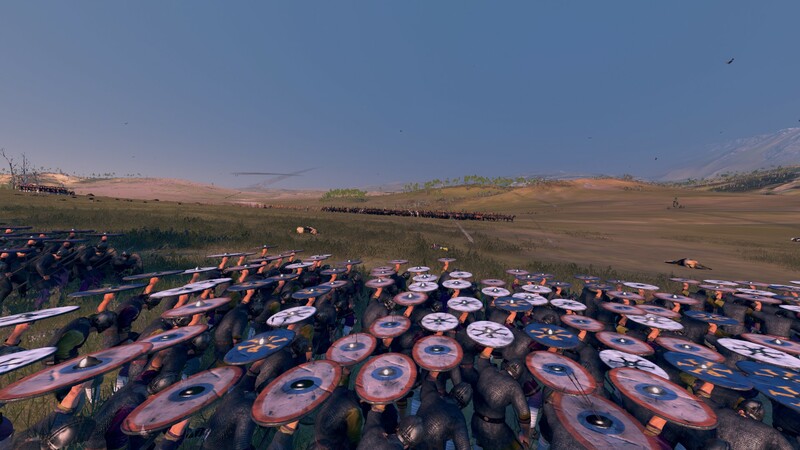 I’ve been able to enlist Sarmatian and Tanukhid horsemen from pacified hordes, although I have yet to make much use of them. Just one more turn… While playing the WRE was intense and memorable, my ERE campaign might just be more fun. Being able to stabilise the situation has been gratifying, and I’ve encountered fewer annoyances — no berserk diplomatic AI or enemy armies leading me on ping-pong chases. Some of this is probably by design; some has probably been luck or experience. Whatever it is, I am having a great time.